The 1000 yen bank note is probably the currency denomination that you find yourself using the most in Japan. What you might vaguely recall about the note is the presence of a face (as with most bank notes). In this case (as of 2004), it belongs to bacteriologist and Nobel Prize nominee Mr Hideyo Noguchi. If you open your wallet now and take a peek, you most likely find one of these useful fellas. Now turn to the back of the note and two iconic elements of Japan – Mount Fuji and cherry blossoms. 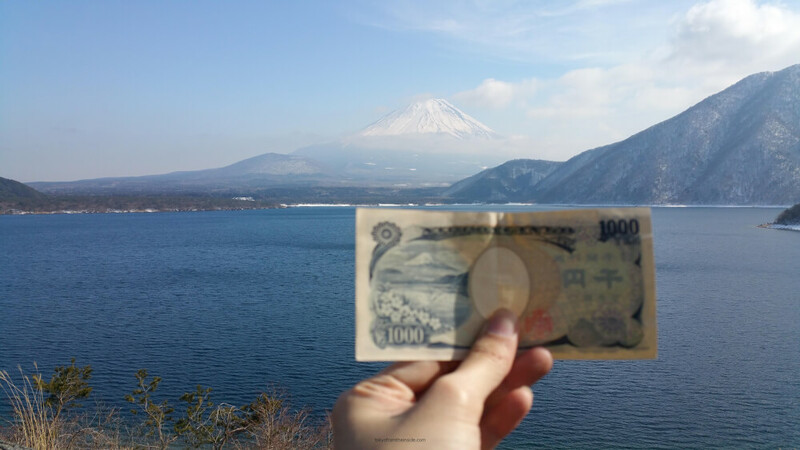 This particular rendition of Mount Fuji can also be found in older 5000 yen notes. It features the sakasa-fuji (or inverse Fuji) view over Lake Motosu in Yamanashi Prefecture. 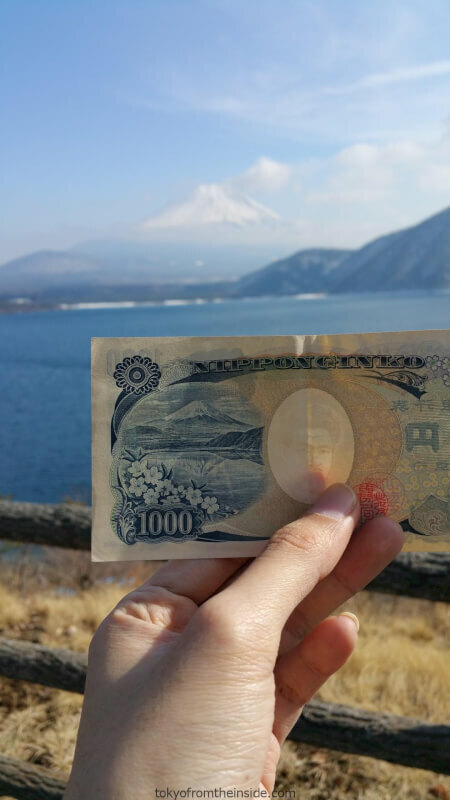 The source of inspiration for the bank note is a photograph taken by famed photographer Koyo Okada called the “Spring by the Lake” (湖畔の春). Now you might be expecting the picture here but there are strict rules regarding the reproduction of Okada’s works. In its place, let me show you another public domain photograph of the “inverse” Fuji. Sadly, when I was there, the waters were choppy and didn’t have a reflection of Fuji. It was also the wrong time of the year, no blossoms. Still a very decent view though. And here we have it, the “Thousand Yen View“. Lake Motosu isn’t particularly the most accessible of the Five Lakes of Fuji and you may find it easiest to get to by car. The best spot for the Thousand Yen view is found right next to Motosu Central Lodge which is a minshuku (family-run lodging). You will find ample space to move around on the sidewalk and parking lots for your car. Below are the view from Google Street View (link) and the map location of this spot.